As well as many other serious parameters. Of course, every platform declares that it is the best: easiest to use, the most cost-efficient and one that gives the greatest features, but what’s the reality? Is it enough for you to make a decision? If not, feel free to contact our experts, and they’ll give you more detailed information about Magento benefits and will find the best solutions for your project. The success of the business depends on many factors, but when it comes to eShops, one of the main metrics are UX/UI design. The first one is designed to awaken people’s desire to make a purchase when they come to the website, and the second helps to ensure their satisfaction, which increases the chance of making another one. British brand which is opening our top 10, ironically closed the list of top 10 of the UK most popular sports brands. That’s a personal brand of the legendary tennis player Fred Perry. It is as classy and minimalistic as back in the days, 65 years ago when it was born. Fred Perry’s web-store is not only a good example of laconic and user-friendly design but also a subcultural platform. The brand has made many collaborations with the popular alternative musicians. There is a huge musical section on the site, where you can find playlists and interviews of your favorite bands. This well-known Canadian furniture retailer was not only able to recreate vintage style in its own online store but also made a full use of multichannel management, tripling the online sales thanks to it. Structube achieved this by launching the “Shipping to chosen store” feature, by using which you can order the furniture you like to the nearest store and take it out from there. This creates a complete picture of interaction with the brand. So that people don’t divide Structube into online and offline, but rather think about it as the holistic and solid brand, which would provide the equal service, no matter what and where. This American startup does not just sell helmets, but truly revolutionizes the whole idea of buying it. The main feature, which makes it so successful is the 3D customizer. Every user can not only find a cool helmet among Helmade product list but make his own unique one. Because of inbuilt WebGL 3D mechanics which is fully integrated with the Magento platform, everyone can customize their scooter or motorcycle helmet, choosing between over than a 100 colors and effects. The systems shows a truly high performance, using the low poly rendering so that even the people with a bad internet connection wouldn’t feel the difference. And, of course, it has a responsive design and available on every device. 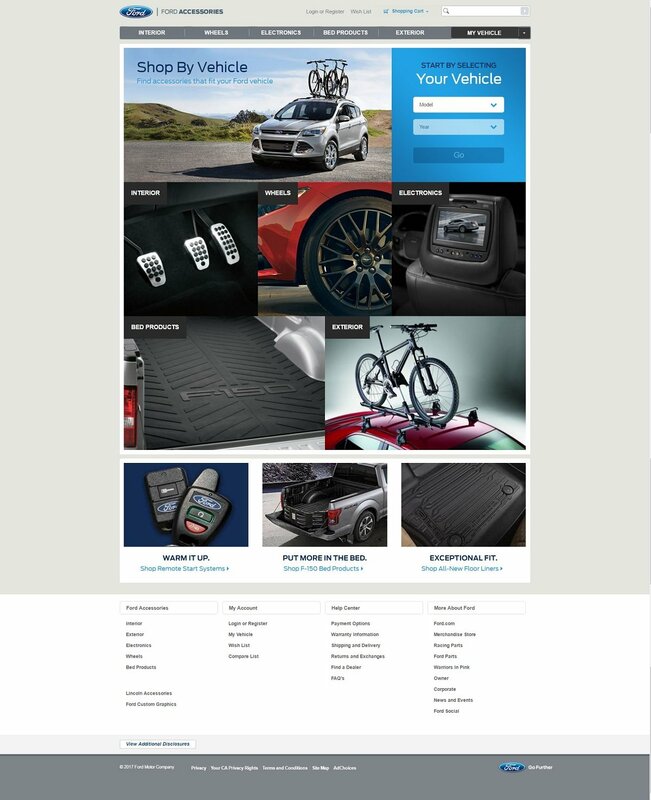 Even such a giant as Ford is using a Magento to improve their online service and ensure the high standards of customer satisfaction. Being a worldwide leader in the car and light truck models segment, Ford fully understands that their service and maintenance should be top notch, so they has launched an online shop with brand accessories. Smart and simple filter system allows to find all the gear by choosing your car model. This facilitates interaction with the brand a lot and the convenient design only enhances it. Tea brand, which is focused on health improvement through the bringing the greatest tea culture practices to everyone. Teatox is using its Magento store as the main online marketing platform. They’ve managed to develop a very light and intuitive design and made a full use of the social media to boost their popularity, making the website not just a regular store, but rather informational and educational source. It’s time for another tennis legend Bjorn Rune Borg. Unlike the Fred Perry, Mr. Borg didn’t run his shop by himself but sold the trademark to the Swedish company. However, this doesn’t prevent the brand from displaying his unique sense of style. Bjorn Borg store is full of space, it’s light and serene. 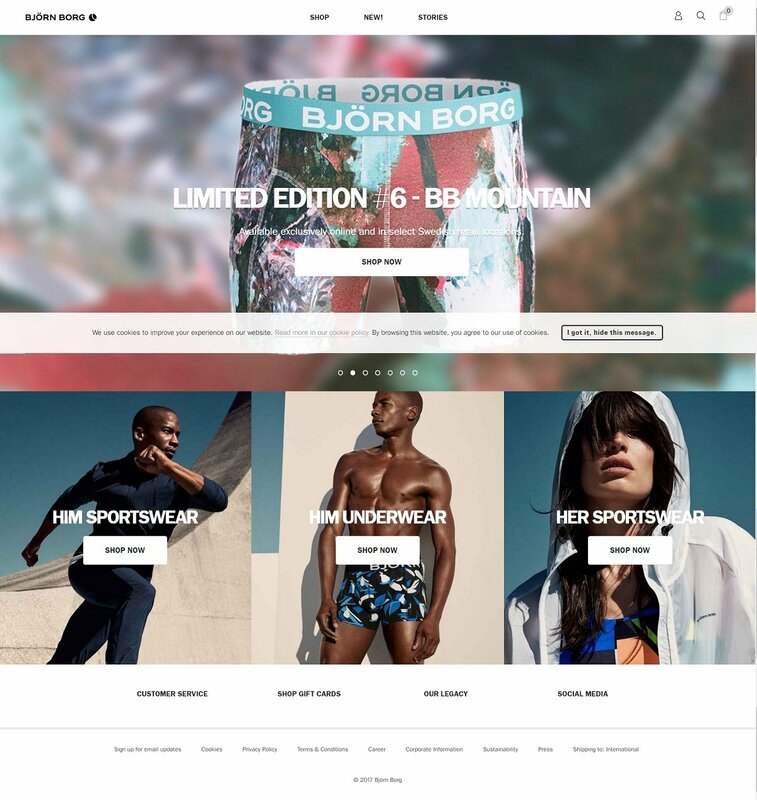 This matches perfectly to the brand’s niche – sports clothing and underwear. They removed all the unnecessary details and categories from the website in striving to protect users from getting confused or interrupted from the main thing they came for – clothing. The whole idea of providing the subscription boxes with the healthy food to every office and family was brand new back in 2009 when Graze was launched. This UK company works in a relatively new FMCG segment, and lure the audience by making their online presence emotionally similar with the brick-and-mortar food store or even with the sweet and fancy kitchen. Graze’s design, informational blocks location, and simplicity made it top subscription brand in the UK and let them sneak into a top 5 in the US with more than a 1.3 million of visits per year. It’s interesting that the brand reached that result in less than 2 years from the moment they’ve decided to expand to the US market. Online store of the US barber and grooming expert Vaughn is focused on the man’s products and I can say that the style of the website makes people stay at least to check out its awesomeness. A 2 columns design with the parallel moving blocks is perfect for the visual experience and at the same time, it’s a good choice for placing all the important info right in front of your eyes. It’s good to know that the world-famous stylist worked on his store as creatively as with his eminent clients. What can I say here? Cola was always in the Olympus of marketing and advertising. Their now-famous campaign “Share a Coke” was started in 2011 in Australia and since that spread all over the world, generating a huge profit. 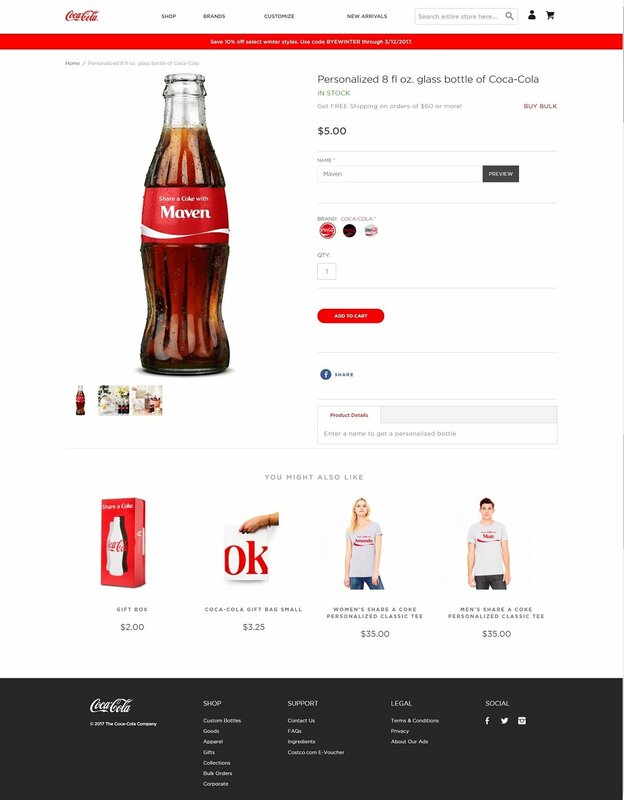 While being on top of that success-wave with the idea of personalization, Cola launched a Magento store, where everyone can brand his own bottle of joy. Altogether the concept, design, usability and advertising made this a perfect example of the online presence and interaction with the customer. Old-fashioned British brand keeps up with the times. Its minimalistic, yet informative and convenient Magento store is also a good example of how the combination of art and usability can build strong relations with the customers. 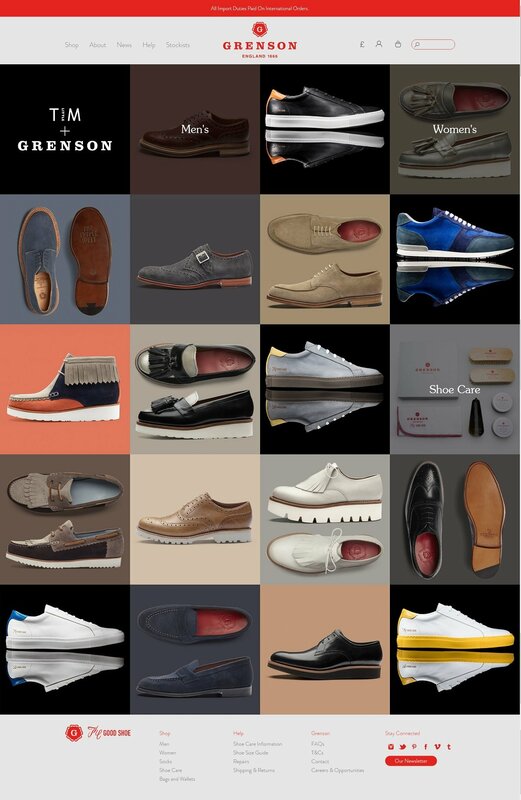 Handy product page in where you could easily set your size, price, and availability, as well as choose shoe caring products leaves a pleasant impression and the design is unobtrusive and classy. 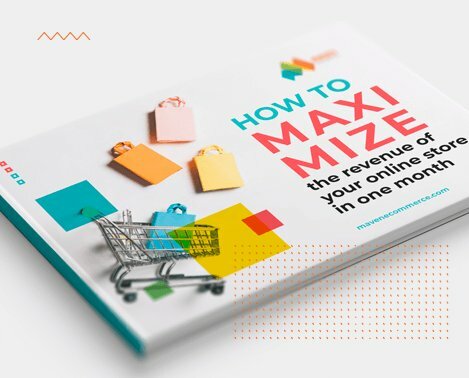 If you want your own eCommerce masterpiece which will amaze the customers and bring the revenue at the same time, just contact Maven. It’s our pleasure to make your website perfect.